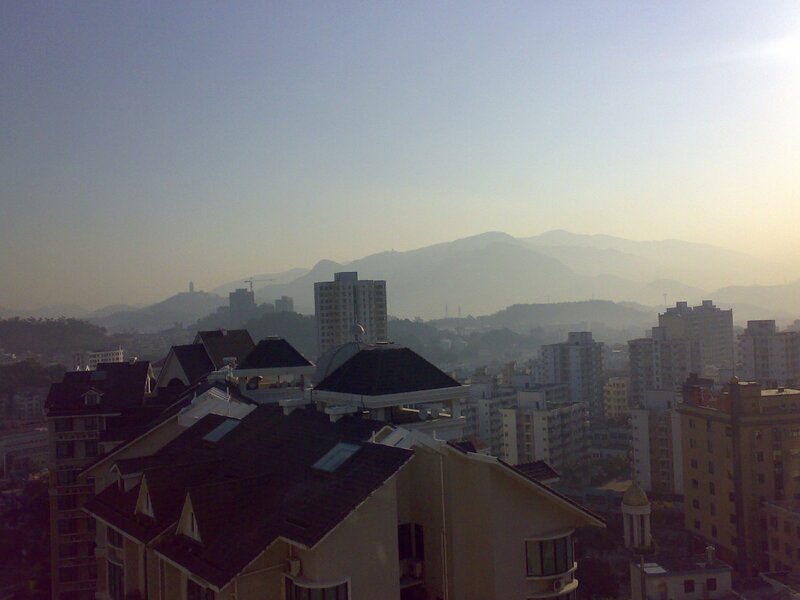 Int he run-up to the Olympics 2008, there are many press articles about the problem of pollution in China and Beijing in particular. Due to the sensitivity of the issue here, real data are unavailable or anyway not realistic. Being a long-stayer here, I guess that my lugs are already thickened by NOx and particulates and getting accustomed, but I can bring here some evidence of what is in front of the athletes. I do not know if other marathon runners had the same feeling before their marathons, but I feel basically "numb". - I feel like crap: a Herpes in my mouth, but worse of all I feel a sciatica-like pain in the right buttock from last week long run (silly idea to run without orthotics) ... 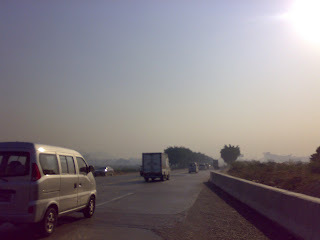 The pain is decreasing day by day but still there especially at higher speed. I guess that I need to pile up in Voltaren and other anti-inflammation pills ... a real mishap after avoiding even the slightest leg pain or injury for all the training cycle !!! I hope everything goes for the best before Sunday. I should be also rest more because I do not feel too energetic at the moment. The estate where I live in Hong Kong houses 9600 residents (10 block/40 floors/6 flat per floor). That is pretty standard in Hong Kong (do not raise your eyebrows ...). The management usually sets up several activities all year round to enliven the community (tournaments, interests classes, etc, etc). Today was the day of the annual Running Festival, where on the 1km driveway around the estate, they held a bunch of races for kids, youths, adults, families resident in the Estate. Coming out from 3 wins in the past, I was pretty confident in another easy win of the "Male Adult" 2k race: a solid pace with the leaders and a surge in the last 500m was usually enough to earn some admiration from my neighbours. There are plenty of runner enthusiasts in the Estate, but the best of them are around 38min/10k runners, so easy prey of a very fit "BY7". So I crawled out of bed 15 minutes before the start, slip on short/shirt/shoes and jog to the (early) 7.15am start. The plan was for a "recovery" day: warm-up, race, some cool-down to reach 8/9km easy after yesterday's long run. At the gun, the unexpected: a young guy (probably just turned 18 and who likely raced in the Youths in the previous years) started fast, very fast. My legs were cold and heavy like marble, my Polar was showing a 3'10"/km pace (!!!) but the guy was simply pulling away. I guessed that it took me at least 600m to react from the shock and made up my mind that even if it was supposed to be an easy day, I did not like to lose my winning streak. With 1k to go, i was probably running in 3'15" (!!) and 10 seconds behind (crazy ...). I slowly gained space to him and let him ahead to cook for a while, placing a surge with 500m to go right while I was passing him. how would you carry some gels during the marathon ? I plan to intake 4 gels during the race, that should give me some small energy for the final miles. using arm pouch ? (horror...), sticking them to the number bib ?, pinning to the singlet (will not they bounce all around ?) ? Hong Kong has many pleasant aspects, one of these is that roads/paths/cycle tracks are all lit, well kept, safe, well organized. It is basically all set out for a 24/7 life. So heading out at 9.15pm for a long run after an hectic Sunday was an excellent way to close the day and the week; the air was getting cooler and there was a sustained northerly breeze from the sea. The cycle track from Shatin to TaiPo spans for over 20km along the sea and it was the ideal setting for a trial run: around 30km, with 15/16km (10Miles) at Marathon Target pace. after a 10km warm-up, I did made 15km at a 3'44" pace (6'00'/M sharp). The HR was in perfect target (167-168bpm) for the first 10k, than started to drift over 170bpm mainly because of the breeze getting stronger (around 10Miles/hr), so it was more demanding to keep the pace. I cut short of the last km because of persistent pain in the right buttock: I guess that wearing the NB RC600 without orthotics was not a good idea as i was probably overpronating too much and straining the muscles too much. This is a corrective action to test asap.... or I will have troubles on race day. 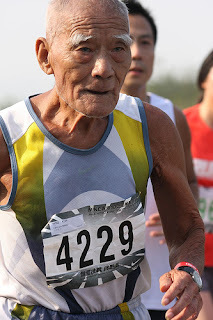 Will you run a sub-2h45' marathon once aged 53 ???? The organizer of Fukuoka Marathon have released the complete starters list. Hei!!! these guys DID run a marathon in less than 2h45' in the past 2 years !!!! (this is the entry requirement to Fukuoka). We still have time to achieve our PB then !!!! I think we all wandered if the starting guns used in track races are "real" guns. My best wishes to the injured teacher, I saw his pic on the papers and he is not really in good conditions. The Leisure and Cultural Services Department has suspended the use of starting guns at its sports venues after one of them went off accidentally and injured a teacher at an athletics meeting in Wan Chai yesterday. Ho Koon-lam, 24, a Chinese-language teacher at Heep Yunn School, took the handgun from a colleague before the start of the 4x400 relay in the school's sports day at Wan Chai Sports Ground. The accident occurred at 11.45am. He was checking the gun to see if there were enough blank cartridges in it before the race started, the headmaster, Lee Chun-hung, said. "Suddenly, there was the sound of gunfire. We saw him covering his eyes with his hands. There was blood on his face," he said. A police source said the victim was taking a close look at the gun before the accident. "An initial investigation showed that the gun went off accidentally and sparks flew and hit his eyes," the source said. The teacher was not wearing protective goggles at the time of the accident, the department said. Eye protection is provided by the venue. Police have taken the starting gun and more than 20 blank cartridges to the force's Forensic Firearms Examination Bureau. Mr Ho, who has worked at the school for about three years, was taken to Ruttonjee Hospital and later transferred to Eastern Hospital. He was in a stable condition last night. After the incident, the school used an air-horn in the remaining three races. Chief Inspector Leung Sai-kau, of Wan Chai police, said an investigation found nothing suspicious. He added the injured man had a permit allowing him to use a starting gun. After the accident, the Leisure and Cultural Services Department decided to stop the use of starting guns at its sports venues. "For sake of precaution, we have stopped using starting guns while the police complete the investigation over the incident," a spokeswoman said. Air-horns would be available. She added that pistols were maintained regularly by a contractor. There were safety guidelines over the use of starting guns and staff members were required to show people how to use them. Starting guns are converted revolvers and can be loaded with five blank cartridges. 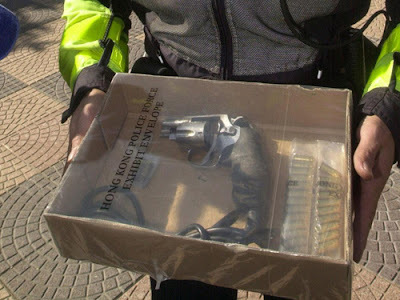 The cartridges contain gunpowder but no bullet. A police spokeswoman said starters had to apply for a temporary permit from the police under the Firearms and Ammunition Ordinance before being allowed to use the guns. it is only a mere 17 days to go to my Fukuoka Marathon. everything seems to go as planned (training, health, race results), but I am assailed now by a dramatic pre-race panic about being able to complete the race. Because the main trick is that their cut-off time is a 2h45' pace. Every 5k, they have cut-off at 3'55"/km pace and if you are too slow .... race over. Fukuoka has been for long time one of the most prestigious marathons and the winners list is impressing (Frank Shorter, DeCastella, Densimo, Dionicio Ceron, Seko, Thugwane, Gebre being the last ..). The main advantage it is probably one of the few races in the world where the starting pack is small (300/400 at the most), and many runners would be close to my level, so I hope to run in a pack as much as possible. Uncle YIP is local legend and I must pay tribute to the vitality of this gentleman who aged 87 (!!!) take the starting line every week-end and can show all the well being of a active lifestyle. 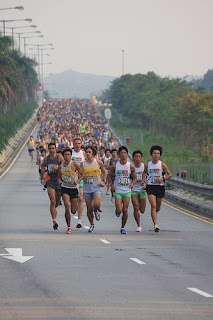 So it cames the day .... the Hong Kong Nike 10K Race is the largest running extravaganza in town (besides the Hong Kong Marathon) and gathers 7000 starters in a far-away district in the North West corner of the Territory. This races marked my personal "first anniversary" of the conversion to a different system of training. Last year, same time, I was doing wonders in my interval training workouts but that Sunday, after only 5k, I was struggling ... the last 3k were like climbing a hill, even if the speed was much lower than my interval training.... at the end, I crawled in with a 35'35", with HR climbing to 197bpm by the last 300m (some unforgiving organizer set the finish line on the top of a long overpass). so we go .... I started very conservatively and I was not better than 30th after 1 or 2k. Then little by little I started to pick-up runners ... the HR climbed to the low 180s and was quite steady. By half race I was in the top 10 and still feeling ok. With 3k to go, I reached a pair who was in 6th,7th place, while the leading group of 4 was definitely too far ahead. I actually started to pay the effort and the stride was a bit heavier than before. So I hang on with them, until the final 500m "climbing" the overpass were an all-out sprint among us, but I was with no more kick and settled for 8th overall (2nd Master) with a gun time of 34'02". I went home with a pair of Nike Katana Racer and 100USD Nike voucher, so it was really a good occasion to celebrate with a huge lunch with the family. Pijamas as running singlet ? This morning was a very quiet 5x1000m @ 3'24" pace + some strides on the school track. 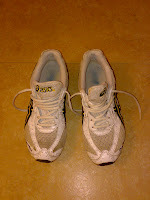 I did not feel "Reactive" legs, probably I have not really recovered yet from the sunday's long run. On top of poor recovery, I feel some tightness in the right leg, I guess due to some poorly-made stretching (I start to believe the stretching can be sometime more dangerous than helpful). Anyway the main topic of this post are the folks who populate the track in early morning. Knowing the secretive nature of chinese institutions, it was quite surprising for me to find out 2 years ago that the primary school 1km away from my house had a all-weather tartan track, and most amazingly the track was open to the public in early morning (from down to school start). Basically it was the real factor that prompted my return to running, because I was really not very keen in running on treadmill all my life. And the track is at a mid-hill location, very quiet and in a good environment. So in late 2005 I resumed running, mostly for the pleasure to make some fast track workout and feel again the unmistakable smell of tartan rubber. - the other folks: it seems that everywhere in the world, many like to go to a track to just walk or stroll around (there are reports about even a walker with a dog). many people run backwards (Chinese believe it is very healthy for the back ... I guess it can be healthy until you crash against someone alse...), many run/walk barefoot but the most amazing are those running in pijamas. Every time I spot 2/3 ladies who jogs in pijamas or night suit. It is definitely a good way to cut on the time needed to reach the track from the bed, but I would not like to try to sleep in my running singlet either. 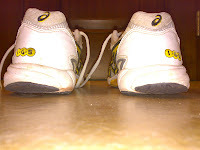 I publish this post in tribute of my Asics Tarther , that after a long life of service have taken the way to the rubbish bin. The photo reveal clearly that they had gone a long way for supporting my heavy stride (I am 70kg/155lbs) with a marked pronation. This morning was the peaking session for my marathon training. - 3rd: 3'52"/km . HR average 168. I was obviously getting tired, but still manage to respect both the pace and keep the HR inside the 170bpm. My biggest issue was strong pain in the feet. I was probably running "heavy" and my NB lightweight trainers are abandoning me ... So I felt every foot landing very painful. today's issue: do you also make long runs with intervals or other kind of variations in pace ? or still prefer the long steady pace run ? Personally, in a modern marathon training, we can not avoid simulating more closely the specific of marathon also in training. For a runner on 70/90 Miles/week, a steady run of 20M can be like "too" easy and not very stimulating. The real challenge of the marathon is keeping the pace also after the 20Miles with depleted reserves and muscular fatigue and this need specific conditioning. What would be more challenging for your mental toughness than a workout on a treadmill watching chinese TV political news ?? This morning I hit the road (by car) very early so I had to skip the daily outdoor run and resort to a evening treadmill run in my china weekday house (all the large housing complex in china have e gym, pooln etc). After 30 minutes of this torture - hit the remote and switched to the 7.30pm english language news on Hong Kong Pearl TV. The main news was that Police had raided a famous fashionable homeware store because it was selling a shirt with a logo "K14" that allegedly similar to the banner of a triad society gang !!!! The 20+ shop assistants and store manager were ARRESTED and now could face up to 5 years jail !! Beware of the T-shirts in your closet:also a owner of a seditious T-shirt can face the same sentence !! This can happen only in a place like hong kong where the criminality is almost absent and the Police has anyway to spend the time somehow. Now I feel ready to run in any circumstance, even watching a Oprah's show ! !